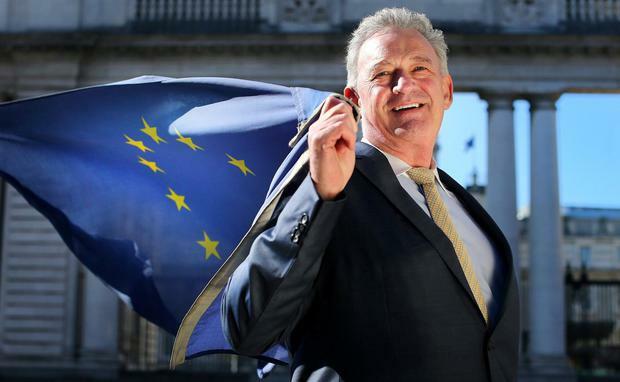 Businessman Peter Casey is to contest the European elections on a platform that seeks to change the immigration system and end the rural-urban divide, the Irish Independent can reveal. The former ‘Dragons’ Den’ investor, who finished second in last year’s presidential election, will run in the four-seat Midlands-North West constituency. Mr Casey rose to national prominence after claiming Travellers should not be recognised as an ethnic minority. The Donegal resident continues to stand by those comments but says his new campaign will be much broader. And he argues that the more than 300,000 people who voted for him “are not all people who don’t like Travellers”. “They like people who say what they think needs to be said,” he added. Ireland should be a world leader in banning plastic bottles. He expects to take the seat of sitting Independent MEP Luke ‘Ming’ Flanagan who topped the poll in 2014. “I think Ming will lose. Nobody has seen him in four-and-a-half years,” Mr Casey said. Fine Gael’s Mairead McGuinness and Sinn Féin’s Matt Carty are also defending their seats, while Independent Marian Harkin is retiring after 15 years in Brussels. Fianna Fáil is running two TDs, Brendan Smith and Anne Rabbitte, in the hope of regaining a seat party officials believe they left behind five years ago. Speaking about his campaign goals, Mr Casey said his main message would be that politics had sacrificed rural Ireland in favour of Dublin. However, it is his views on one of the EU’s hot topics -immigration – that are likely to be closely scrutinised. Mr Casey describes the situation facing asylum seekers living in direct provision as “an absolute tragedy”. “You shouldn’t bring people in if you’re not going to look after them,” he said. Mr Casey said “a discussion” on immigration needs to take place rather than a situation where people are put in “over-cramped hotels and given €21 a week to live on”. He also questions whether other EU countries have facilitated asylum seekers coming here. Asked for his position on EU membership, Mr Casey said he believed Ireland should remain in the union but leave the eurozone. “We should [be in the EU] but I don’t think Europe should have so much control over the day-to-day running of the country. I believe countries should have their own currenc0ies. That gives them the ability to control their economy,” he said. One of his key campaigns, if elected, will relate to the environment. He wants to ban single-use plastics in Ireland. “I believe it is a solvable problem and wouldn’t it be great if Ireland was the one to lead the way,” Mr Casey said.